The following is a guest post about budget holiday destinations. If interested in submitting a guest post, please read my guest post policy and then contact me. The global financial crisis has left several European countries racked with debt and riddled by soaring unemployment rates. As these hardest-hit countries focus on recovery, many will look to their tourism industries to help kick-start spending and revive their economies to what they once were. Spain holidays often already come at bargain prices for British holidaymakers, yet the recent economic downturn has made trips to the Costa Brava, the Costa Del Sol and the Balearic Islands more affordable than ever. With those in the tourism industry keen to boost sales, prices have dropped an astonishing 20% for tourists in Spain. The popular beach destination also offers some of the lowest living costs, with food, accommodation and attractions all ringing in at far less than most sunny European destinations. The financial crisis took a while to reveal itself in Cyprus, but the penny finally dropped in the spring of 2013, when the combination of bad loans linked with Greece and withdrawals from foreign account holders lead to a full-scale banking crisis. Fortunately for the tiny Mediterranean island – characterised by its resilience in the past – it has a mature tourism industry to fall back on. Though it will take years for Cyprus to fully recover from this financial crisis, its position as an attractive tourist destination will certainly prove beneficial. In the meantime, British tourists can expect better deals on holiday packages to popular resort towns like Ayia Napa and Paphos. Egypt’s tourism industry isn’t just suffering as a result of the global financial crisis. The country’s on-going political instability has also wreaked havoc on its economy. As a result, the value of the Egyptian pound continues to fall, the national deficit keeps rising and foreign investors are looking elsewhere. Although government travel advisories may warn tourists against travelling to Cairo, Egypt’s Red Sea resort towns are still safe for tourists seeking sun and relaxation. 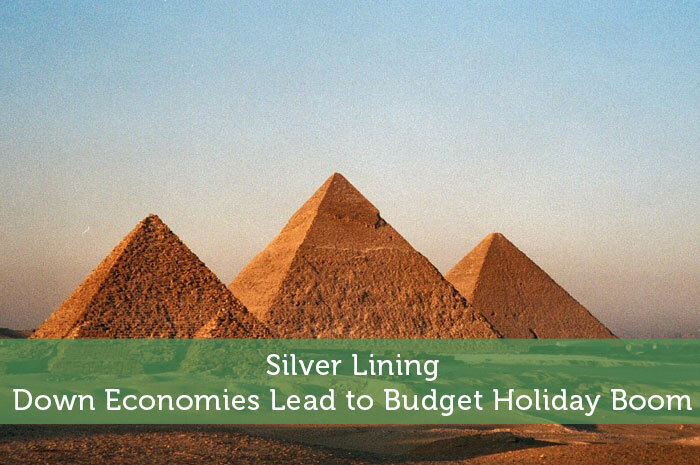 As long as inflation is kept at bay, tourists in Egypt stand to benefit greatly from the current exchange rates. So, whilst the flailing economies of foreign countries are certainly nothing to draw pleasure from, the situation does present an opportunity for tourists and local tourism providers to mutually benefit from each other. Politics aside, one of the best ways individuals can support these suffering economies is to travel to the destinations and spend, spend, spend. Author Bio: Michael Docherty likes to travel on a shoestring and tell his stories whenever he’s got a chance. Having spent the summer travelling around the Mediterranean, he’s extremely up to date with Continental travel news. Good post – and it doesn’t hurt that the dollar is strengthening on top of that! It is amazing that the dollar is strengthening with all the money being injected into the economy. Yes a strong dollar certainly makes an impact on how affordable a foreign vacation is. Their pain, our gain I suppose? Plus we can pump some money into a depressed economy, which is never a bad thing. However, I believe I’ll hold off on any Egyptian vacation plans…for the moment! lol yes I think a lot of people would be looking to delay an Egyptian holiday these days. And yeah it does help their economy to go travel to such countries while you also benefit from good deals. So it is a win-win situation. I love to travel, but I am not so sure I would be heading to Egypt any time soon. I’ve been to the Middle East before, but to be honest I’m not all that interested in going back, even if there was no political turmoil. My brother was in Egypt last year. At least he not there now I suppose.. It would be a bit scary to know a loved one was in a potentially dangerous country at the wrong time. Greece also offers amazing deals, especially if you go in June or September, I rented a room in Santorini for about $25 a night for two with kitchen and swimming pool last June. That sounds like an awesome deal. Perhaps we will be headed to Greece sometime in the next couple years. Sad that it’s happening…but maybe for us it’s time to take a vacation. Yes it must be rough to live in those countries these days, but at least they are in a desirable area to visit which is bound to help their economies recover. Well, I would certainly stay away from Egypt now that the situation there is escalating. Prices might drop even further after it stabilizes and it will also probably become much safer. I don’t know how much safer it will get there. Things seemed to be settling down until it all flared up again. I haven’t traveled in awhile but I plan on doing a lot more of it soon. Cyprus and Spain sound great. I really want to visit Italy and Greece as well. Paxos and Santorini Greece are two places the wifey and I are dying to get to. The prices are right but with a family of five and school just starting we will have to wait a little while. A big family would certainly make traveling more challenging. Not only is the cost way higher, but they’d likely rather go to Disneyland. Great points! Looks like now is a great time to travel, I’ve been to several countries on the list and they’re awesome! Lucky you. I’m sure this is just a small sample of countries where economics make it more favorable to visit. Greece is also one of the countries still struggling with the recession and there are some amazing deals – I saw offers for 7 nights with breakfast (no transportation) starting at 50 EUR per person. Yup, that’s 7 Euros per night on an island in Greece! Geez that is cheap. Now if only it were cheap to fly half way across the world to get there. Great article, I have who says that Greece has actually become more expensive recently. Do you know anything about this? I haven’t heard anything about that, but I wouldn’t be surprised if some areas there were actually trying to milk extra money from tourism.